First, a reminder of a great “one stop shop” for the official word on what a given storm is up to, the National Hurricane Center’s “Key Messages” graphic. It’s pretty straightforward, to the point, and part of the official package on a storm. Worth watching. Interpreting “spaghetti maps” takes years of training and experience. It’s one reason why you should be watching that red line (the official NHC track) and not worrying so much about all the other clutter. It’s like going to the doctor – you have lab work with all kinds of scary numbers, MRI scans, etc. What matters, and what doesn’t? It takes an expert. With hurricanes there are always two related questions: where is it going, and how bad will it be when it gets there. We’ve gotten somewhat better at the “where is it going” (although better is a relative term; average day 5 forecast errors for the official forecast are around 200 miles). For Florence, there is a big question about the steering Tuesday and later. There will be high pressure to the north and east of the storm. Exactly where and how strong is uncertain, and that is causing the reasonable day 6 (Thursday) forecast location to be within a 800 mile wide swath ranging from the GA/SC border to out between NC and Bermuda! The “how bad” part is even harder. Florence is currently a tropical storm. It should strengthen, and could be as strong as a category 3 storm at landfall. However, intensity is tied closely to track, so with so much uncertainty in the track, the intensity forecast is also uncertain. So what’s the short version as of Saturday AM? Florence has the potential to be a bad storm for somebody on the US East Coast, Bermuda, and/or Canada later in the upcoming week (Wed/Thu/Fri). 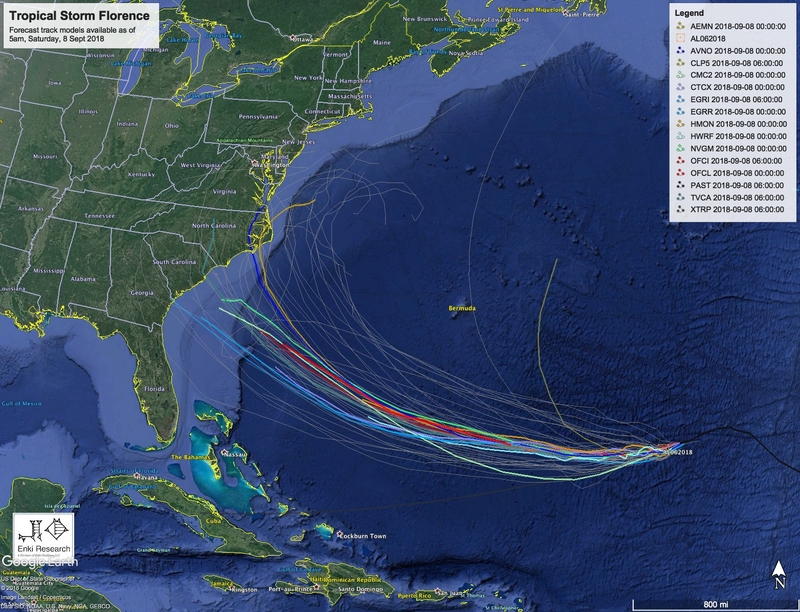 Most likely estimate at this point for hazardous impacts is the North Carolina coast, with points northward (DelMarVa, etc) also likely to see impacts, but South Carolina is not out of the question, and even the Georgia Coast in theory is within the “cone of uncertainty.” HOWEVER, the storm is still beyond the range of the primary hurricane models. Forecasts beyond 4-5 days are fraught with error. For technical reasons noted above there is a lot of uncertainty as to when and where the storm will make its northward turn. What should you do? Well, if you have a hurricane plan just watch the theatrics (and if you live on the coast you’re crazy not to have thought about what you would do, but if you procrastinated again this year look at the FEMA site for some checklists). Still plenty of time to wait and see, then act if it turns out to really be headed your way. It will be tomorrow before we have some clarity as to the future path (and even then there will be some fuzziness – there always is – but at least it will be actionable fuzziness). It is possible some state and local officials will “jump the gun” and start actions this weekend, but if I were them I would be watching, getting things ready in the background, reassuring (not scaring) the public, and getting ready to kick off actions first thing Monday morning.